Students of Color (SOC) @ Columbia provides students with cultural student group advising, events, education, advocacy and other resources to help all students explore and better understand racial and ethnic identities, histories, experiences and communities at Columbia and beyond. Additionally, as part of Multicultural Affairs, we hope to create a campus environment that is inclusive and supportive of student diversity in the areas of race and ethnicity. For more information, please email Multicultural Affairs at multicultural@columbia.edu. Be sure to subscribe to our Students of Color @ Columbia announcements for updates and events! The Student of Color Advisory Board (SOCAB) is part of the Multicultural Affairs Advisory Council (MAAC) under Multicultural Affairs. These undergraduate students work towards a more respectful, accountable and socially just campus environment by identifying campus issues and work closely and collaboratively with Multicultural Affairs and other campus partners to develop realistic and action-oriented solutions. Like each MAAC student advisory board, SOCAB works with a corresponding administrative resource team spearheaded by Multicultural Affairs. 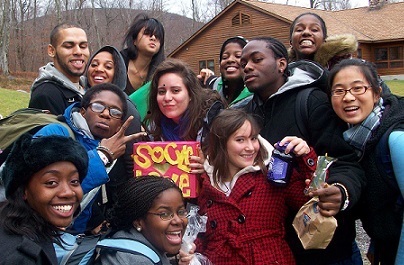 Informed by the work of SOCAB, the SOC Resource Team is a cross-functional team responsible for identifying unique and/or specific issues facing students of color. Each individual member of the team serves as a liaison, contributes to the conversation and shares pertinent information back to their respective office. Each team supports the development, planning and implementation of initiatives aimed at assisting their respective population of students in Columbia College and Columbia Engineering. SOC team membership consists of staff from Multicultural Affairs, Center for Student Advising, Counseling and Psychological Services, Undergraduate Admissions, Global Programs and Fellowships, Center for Career Education, Alumni Affairs, Alice! Health Promotion and Sexual Violence Response.